BRISTOL SHOW 2011: 'TheONE' crosses the Atlantic to make UK debut | What Hi-Fi? It's a diminutive design, measuring just 16x14x16cm, but Audience says it's not just a 'style speaker'. At its heart is an A3 full-range driver, featuring a 7.5cm coned speaker with a 'flat response from 40Hz up to 22kHz', the company claims. It's designed for use with amplifiers up to 100W, and while it's ideal for use with a computer-based music system or second-room set-up, it's also good enough to use as part of your main hi-fi, says Audience. 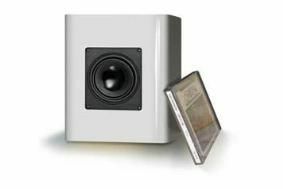 Air Audio will demo TheONE alongside its bigger brother, the new stand-mounted ClairAudient 2+2, at the Bristol Show 2011. There will be "generous discounts" on all products bought at the show.